yoga props, handmade products, clothing, Young Living essential oils, gift certificates | Moonflower Yoga Inc. It is recommended that you have your own yoga mat. 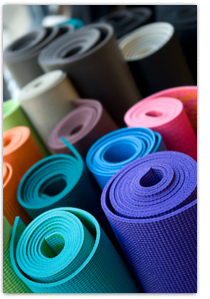 Yoga mats in a variety of fun colors and designs can be purchased at the Moonflower Yoga studio. We also sell hand-loomed cotton yoga blankets, each of which is unique. Many of our students love these warm, comfortable, machine-washable yoga blankets. Bolsters, zafu meditation cushions, yoga straps, mat bags for your yoga mat, eye pillows, and traditional yoga blocks are among the other supplies also available for sale. Check out all these great items today! If you have attended a class or workshop at Moonflower Yoga, you have enjoyed the beautiful scent of essential oils being diffused at the studio. These lovely essential oils have many amazing uses, including helping you feel calmer and more relaxed. Try lavender, Stress Away (the name says it all! ), Joy, peppermint, cedarwood, bergamot, or a fabulous citrus scent such as Jade Lemon, orange, tangerine, or Citrus Fresh. Looking for a spicy scent? Try Thieves, cinnamon bark or clove. These oils and the other wonderful essential oils sold at the Moonflower Yoga studio in Bellmore, Long Island, make a fabulous and special gift. Come and sample an essential oil at the Moonflower Yoga studio, and you are sure to find a perfect essential oil. Moonflower Yoga also sells these lovely roll on sets from Young Living which make a wonderful gift. 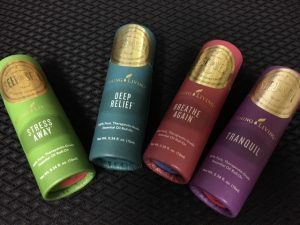 Try Tranquil, Breathe Again, Deep Relief, or Stress Away. 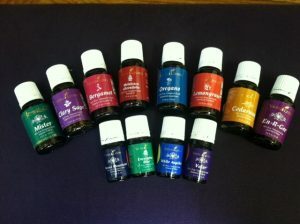 They come in a beautiful glass bottle with a roll-on tip for easy application and contain your favorite essential oils. Enjoy these for yourself or give these as a special gift! If you have attended a class or workshop at Moonflower Yoga, you have enjoyed the beautiful scent of Young Living essential oils being diffused at the studio. These lovely essential oils have many amazing uses, including helping you feel calmer and more relaxed. For the month of March, the featured essential oil is sage. Sage was used by the ancient Romans, and was referred to as “herba sacra” which means “sacred herb”. It has a wonderful aroma, and can help you feel more relaxed. Sage oil may also help with balancing of the lower chakra energy centers in your body. Dried sage has been used by many cultures for “smudging”, a technique to remove negative energy from a space. With smudging, a dried bundle of sage is lit on fire and then immediately extinguished into a bowl, with the smoke directed into the room in need of clearing. In today’s buildings, it might not be possible to light a sage stick to smudge a space due to fire regulations. Instead, by using sage oil with some water you could create a sage spray that can be used as an alternate way to smudge. 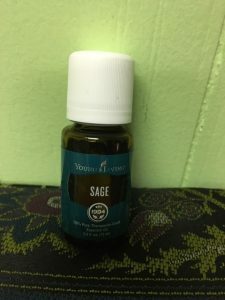 Sage oil and other wonderful essential oils can be purchased at the Moonflower Yoga studio. Sage sprays are also available. Come and sample this beautiful oil on your next visit! 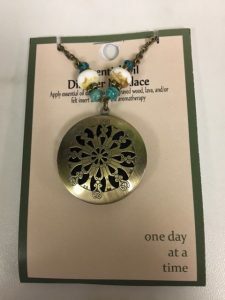 Moonflower Yoga is proud to be a distributor for beautiful AAOTE jewelry. 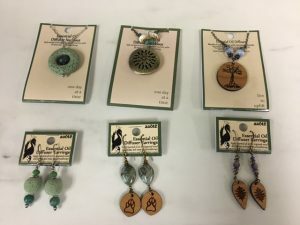 AAOTE makes lovely aromatherapy necklaces, bracelets, and earrings on which you can dispense your favorite essential oil and then enjoy the fragrance of essential oils on your jewelry. 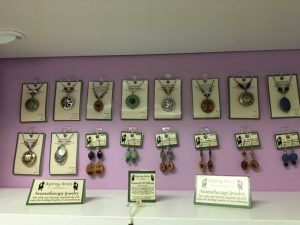 You can choose from lava bead necklaces and earrings, carved wood necklaces and bracelets, and lovely medallion necklaces. All pieces come with crystal beads. Stop by the Moonflower Yoga studio to purchase yours today! Looking for a special gift for yourself or someone in your life? 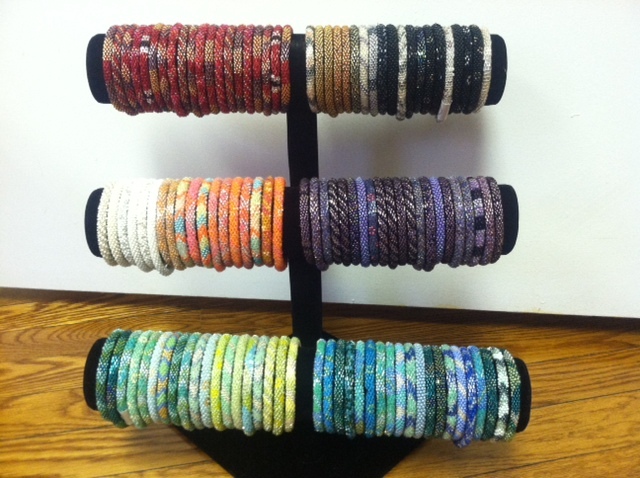 Try one of our beautiful, handmade bracelets. Each unique bracelet is made in Nepal by a women’s fair trade cooperative. Your purchase enables the women to receive a fair income in a safe work environment. 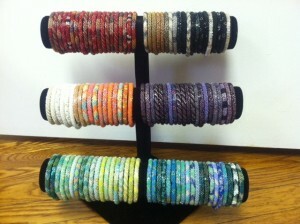 These bracelets come in a beautiful array of colors: red, purple, green, blue, white, black & orange. Each bracelet is $19. Purchase 2 or more and they are just $16 each! They make a great gift! You can purchase these lovely bracelets at the Moonflower Yoga studio in Bellmore, New York, in Long Island’s Nassau County. 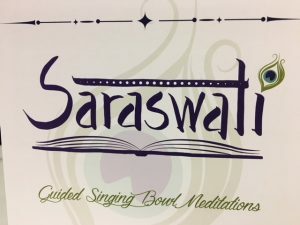 Jessica Saraswati has recorded a wonderful CD of her guided singing bowl meditations. It is a great way to enjoy Jessica’s guided singing bowls from home. Moonflower Yoga has copies of her CD for sale. Come purchase yours at the Moonflower Yoga studio! Moonflower Yoga also offers additional products for sale at the studio which are lovingly handmade by local artists. Come visit the studio to learn more about these beautiful products and to purchase a special item. 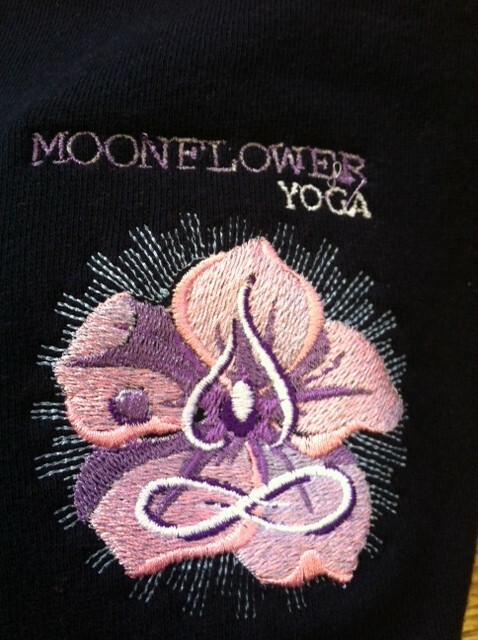 Great accessory: Our signature, hand-embroidered Moonflower Yoga super-soft fleece hoodies! C ome try one of our very soft, full zip, fleece hoodies! Each one is hand embroidered in Bellmore, and they easily machine wash/dry. They’re perfect for a spring or autumn day when you want a comfy jacket instead of a winter coat. They come in purple or royal blue. 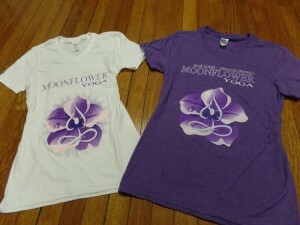 Stop by the Moonflower Yoga studio to pick up yours today! Year round logo t-shirts hand printed in Bellmore are also available in a great variety of different styles, sizes, and colors. Our popular short-sleeve t-shirts are available in a flattering v-neck style in purple and white. We also have shirts in aqua. Looking for a long-sleeve shirt? We have some fabulous long-sleeve shirts in a soft cotton blend material with stretch! These come in various styles and colors. Stop by the Moonflower Yoga studio to see this great selection. NEW LONG-SLEEVE T-SHIRTS HAVE ARRIVED! With the start of cooler weather, NEW, long-sleeve t-shirts have arrived! These NEW, great, super soft t-shirts come in a light, heathered-blue shade and are in everyone’s favorite tunic style. Come pick up yours today at the Moonflower Yoga studio! In addition to the new light, heathered blue color, this comfy, long-sleeve tunic shirt also comes in charcoal gray-black, as well as royal blue. Comfortable cotton long-sleeve t-shirts in charcoal gray. Great for women and men. Also available in royal blue and heathered blue. 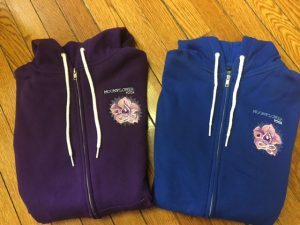 Stop by the Moonflower Yoga studio to see these hoodies and t-shirts in person and to select one that is perfect for you or a special person in your life. 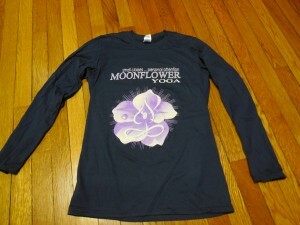 Can’t make it to the studio but would like to purchase a product from Moonflower Yoga? Our items make great gifts! 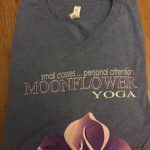 Moonflower Yoga can ship any of our products to you including custom t-shirts and hoodies, essential oils, handmade bracelets, and yoga supplies for your practice. 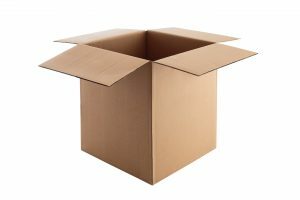 We can ship our items anywhere in the continental United States. Just give us a call at (516) 557 2206 or send an email to moonfloweryoga@optimum.net to let us know what you would like to purchase. We accept MasterCard or Visa.